Volkswagen employees work beneath vehicles moving down the assembly line at the Volkswagen Plant Thursday, Aug. 31, 2017, in Chattanooga, Tenn. Updated at 6:02 p.m. on Tuesday, April 9, 2019, with photos and more information. For the third time in about five years, some Volkswagen plant workers in Chattanooga are seeking an election to align with the United Auto Workers. "It's pressure from the workers," said Steve Cochran, president of UAW Local 42 in Chattanooga, about why the election petition was filed Tuesday with the National Labor Relations Board. * December 2017: NLRB reverses decision on micro-unions and gets case back from appeals court to reconsider it. The petition said that at least 30 percent of the 1,709 production, skilled trades and other employees making up the proposed election unit have turned over cards seeking representation by the UAW. The petition seeks to hold the election April 29 and 30 at the Chattanooga factory. Volkswagen factory officials on Tuesday said they "remain neutral on this topic." Plant spokeswoman Amanda Plecas said officials are reviewing the petition and it's too soon to comment further. The NLRB will be expected to hear a response from VW about the petition and then the federal agency will decide whether to go forward with the election and when. In 2014, the union lost a vote of the plant's workers by a margin of 712 to 626. In 2015, the UAW won an election involving a much smaller unit of workers by a vote of 108 to 44. 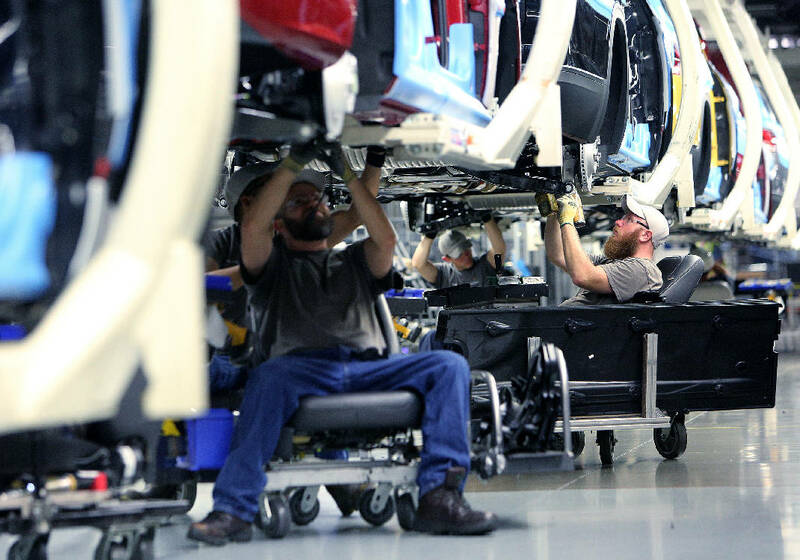 Those maintenance, or skilled trades, workers fix and maintain the equipment at the auto plant that makes the Passat midsize sedan and new Atlas SUV. But VW appealed the second election result and has refused to bargain with the so-called micro-union, claiming it wanted the entire group of production and other workers to vote. That case now sits before the NLRB. Cochran said plant employees now work under a community organization engagement policy that enables groups to dialogue with factory officials. But, he said, while the policy permits workers to make suggestions to the company, it doesn't have to act. "Until there's a contract, it's just suggestions," Cochran said. "Maybe it follows through and maybe it doesn't." Brian Rothenberg of the UAW International's office in Detroit said it was only a matter of time before another election involving the bigger unit would happen. "Workers want a say in this plant," he said, adding the election is also about wages, work schedules and safety. Rothenberg said the Chattanooga VW plant is the only one in the German automaker's network of factories worldwide that isn't unionized. "It's the only VW plant where workers make suggestions rather than sit across the table," he said. Dan Gilmore, a Chattanooga labor attorney who teaches at the University of Tennessee at Chattanooga, said a proposed election date of just three weeks away is "pretty quick." "I'd say that's an unusually short period of time," he said, adding that most employers want a more extended time for informational meetings and campaigning. But, Gilmore said that VW saying it's neutral is "very far from the norm" for companies. He noted that the 2014 election petition was filed by the company, which itself was highly unusual. "A small fraction are [filed by the company]," Gilmore said, adding that the "vast majority" are filed by another group, such as the case this time around. Patrick Semmens, vice president of the National Right to Work Legal Defense Foundation, said he's surprised the UAW chose this moment for a redo election "given that so much of the union hierarchy is wrapped up in the ongoing union corruption prosecution in Detroit." Last week, he said, a former UAW vice president in charge of the union's relations with Fiat Chrysler Automobiles pleaded guilty in federal court to misusing the automaker's funds for lavish spending on UAW officials. Semmens said that in 2014 the foundation's staff attorneys represented VW Chattanooga workers in two cases to "protect their rights." "With today's announcement Volkswagen employees should know they can contact the National Right to Work Legal Defense Foundation for free legal assistance if they believe their legal rights, or the rights of their colleagues, are being violated," he said. But Annette Stallion, a Chattanooga production worker on the day shift, said it's time for a new vote at the plant. "Our maintenance workers voted to form a union and VW still refused to bargain. They said they would bargain if production and maintenance workers voted — so let's vote," she said. Ashley Murray, a Chattanooga production worker on the night shift, also asked why Chattanooga workers "are treated differently." "Why in Chattanooga do we have to make suggestions, not sit down and bargain like every other VW plant?" she asked.